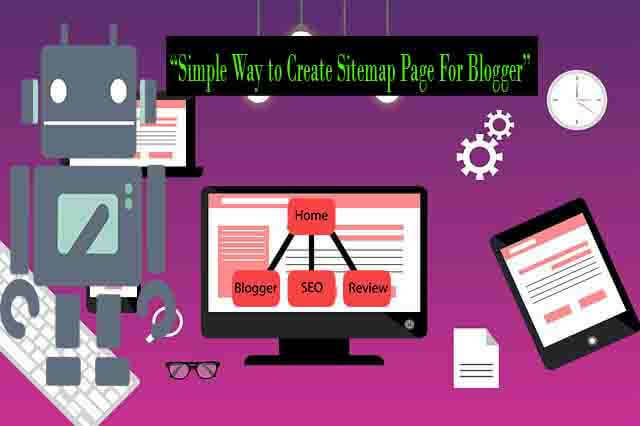 Create Sitemap Page For Blogger - If you looking to arrange you are all of your Blogger page, categories, label as a listing on one page. This Sitemap page looks really ugly but doesn't worry because this page is not for your website visitors to actually be able to see it this page is only for the robots that are sent to your website to be able to more easily find the content that you have in your website especially. So sitemap has two purposes one for the user and two for search engines. So the user benefits from sitemap because they can go and if they can't find a page of your site through the main navigation. They can actually go and look at your sitemap and possibly find the information. They're looking for through that so you can if you have a large site you can actually break down your sitemap into smaller sections by categories or alphabetically or various different other methods. So this is very beneficial for users in helping them to find information on your site that they may not otherwise find through the main navigation. The second purpose is for search engines so how they benefit how search engines better for in sitemap is they can actually go and crawl your sitemap and find all the different pages of your site and so it'll help indexation and also for SEO purposes in order to help certain pages rank for certain terms so those are the benefits of a sitemap. Many methods you can find in to make a sitemap for blogs. You can create a sitemap with HTML and XML Language to describe your website content. 4. Make change blue color highligted domain name. 1. Go to blogger dashboard click Theme click on customize button. 2. Click Advanced > Add CSS you can see a box. 3. Below CSS code copy and just paste it to box. When your website starts getting bigger you have a lot of content it may be hard for them to find your newly published content and by having a sitemap. It makes the robots life a lot easier because they are able to find your content more easily and for that reason, they can index it on their search engine more quickly. Googlebot can easily crawl and index your site I hope this "Simple Way to Create Sitemap Page For Blogger" help you to create a sitemap for SEO blog. If you like this article share with others people.